Would it be blasphemous to bleat that D.O.C.G. might be as good or better than Scarpetta, its sister restaurant next door? It’s certainly less formal, noisier, and simpler in focus and form. The menu breaks down into short sections — from salumeria to secondi (main) courses — and none of them overwhelm you with anything other than how friggin’ good everything tastes. D.O.C.G. stands for Denominazione di Origine Controllata e Garantita — and, along with the enoteca designation, denotes a place were good wine is of paramount importance. As good as those wines are (and assured of getting better under Paolo Barbieri), this name only tells half the story of this place. Because two or three bites in, and you’ll be swooning as much over what you’re munching on as much as over anything you’re sipping. Only four cheeses and salumi are offered — but all are of impeccable provenance and ripeness. Likewise, the assaggini (small vegetable plates) are only eight in number but each one a marvel of its main veggie given a single, forceful accent. In the case of beets, that accent is provided by good feta cheese; cipolllini (small onions) are dressed in an ago-dolce (sweet/sour) sauce; and cauliflower is tossed with mint, all to great effect, and all catering to the “Eat food. Not too much. Mostly plants.” – crowd. There’s no faulting the roasted Brussels sprouts or the mushroom sott’olio either. Pastas are equally simple, but no less satisfying. The pici (hand rolled spaghetti in braised duck sauce) is the equal of any pasta dish in any Italian restaurant in town — as are the malloreddus (semolina gnocchi with sausage) and veal raviolini with spinach and sage. You pay for all this perfection, of course — all pastas run around $20/serving — but it’s a testament to how far Vegas’ Italian restaurants have come that such thoughtful and toothsome recipes are being featured in the casual/cafe to a more formal ristorante next door. Those finding the pasta prices a bit trés chere will be heartened by the main course tariffs. Whether it’s the smoky, double-cut rib eye for two ($48), the branzino ($25) atop beautiful couscous in aqua-pazza (crazy water), or the brined/glazed Berkshire pork chop ($26), each of these secondi piatti brings forth enough protein in one order to feed two. And then, there’s the pizza. Not quite in Settebello’s league, but just about the finest pie, made with the finest ingredients, you’re ever going to find in a hotel pizzeria. Chewy, crispy crust. Thin, but not too thin. Topped with everything from housemade sausage to fresh ricotta to bufala mozz — these are pies worth going out of your way for. The margherita (pictured above) is a thing of beauty, and like those assaggini, and the pastas, and calamari, and the salumi and the sea bass, this menu demonstrates how much our everyday Eye-talian food has evolved in a few short years. All this from the casual, more rustic cousin of Scarpetta. 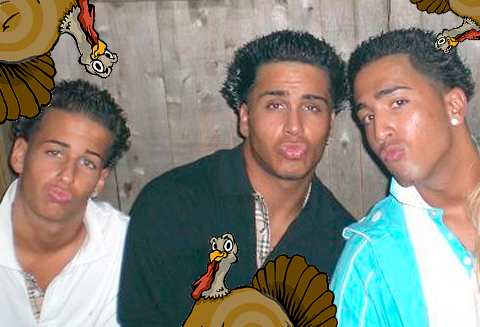 The bar has just been raised paisanos, and other places had better be paying attention. ELV has had three meals at D.O.C.G.. He paid $68 for a couple of pizzas and some small plates, and the other two meals were comped. Paolo Barbieri is Alive and Well at SCARPETTA/D.O.C.G. Hi all, hijacking John’s site for a moment to give a heads up that the gavel comes down Sat at 1pm in the Western States Public Radio Online Auction. 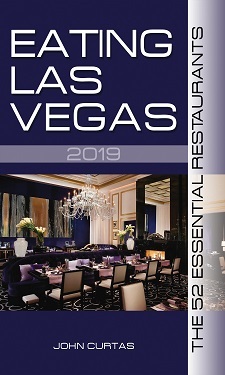 Here’s a quick link to the dining Nevada category. Guy Savoy, all the Cosmopolitan’s new offerings and much much more, including staycations at some of John’s favorite haunts.
. . . and now back to our usual gustatory gesticulations or something . . . Nevertheless, I concur, of course. Should feel like a womens breast. We get the consistent sexual references. Move on. Also you hate beets, should have been noted. And if thats a 4 bone rib eye my name is sally. Or steve. Looks overcooked. Act like a real critic, stay under the radar, quit accepting comps, and give us real reviews. Jose Andres restaurants in DC are overrated, crap except for the experience at minibar, STK is a corporate conglomerate giving us loud music and the same steakhouse experience as, well, any steakhouse, and Milos, while great, is getting some greek love because its the only game in town. Anyone know what the critics look like in Chicago or NY? Nope. Off my high horse/soap box. Steve – The problem isn’t with John, its the system in Vegas. In order for John to quit accepting comps someone needs to fund his reviews, nobody in media is willing to pony up for the job and also since he is not exactly undercover I think its something we all have to learn to live with. John will fade of into obscurity once the major media outlets decide to enter the market, for now they are too busy catering to the lowest common denominator which still thinks Olive Garden is the #1 restaurant in Vegas to focus on fine dining reviews . Until that time long live John, Max & John. Its better than nothing, lucky for us his biases are pretty transparent. PS: I concur about DOCG (with the exception of the charcuterie which is not ideally sourced), this is interesting since Scarpetta did not live up to expectations at all. I think the best way to explain it is that DOCG compares favorably to Otto, however Scarpetta is not even in the same league as B&B or even Bartalota. And I also disagree about Jose Andres in DC. This is the best deal in Vegas. The pastas are reminiscent of Valentino at it’s absolute prime for one third the price. I was absolutely blown away by the Pici pasta and the veal chop. I have not had anything in this town after living here for over a decade and eating out three to four times a week of this quality at this price point. Get in there before they figure it out and start raising the prices. I’m serious.